The most common challenge for pet lovers who prefer owning exotic animals as pets is finding an exotic animal vet who specializes in treating such animals. These exotic animals are not like our normal dogs and cats that a lot of vets already have much knowledge on. Exotic animals are mostly born in the wild, rescued from the wild or born of parents from the wild. Their body mechanism and behavior is completely different from what most vet personnel are used. Therefore it will take an exotic animal vet to treat them most of the time when they are unwell. This would have been a simple a matter if there were a lot of such professionals available. As it stands, a good number of pet care centers don’t offer exotic pet care meaning there will be challenges as an exotic pet owner. For Texas residents, Safari Vet remains one of the advanced veterinary care centers for pet owners. The center is made up of a team of professional, well-trained veterinarians who are knowledgeable in all aspects of exotic pet care, surgery, and medicine. Safari Vet exotic animal vets are capable of delivering treatment to a wide range of different animals like birds, non-poisonous snakes, monkeys, lemurs, raccoons, ferrets, apes, sloths, turtles, iguanas, kangaroos, and as many other animals as you can think of. 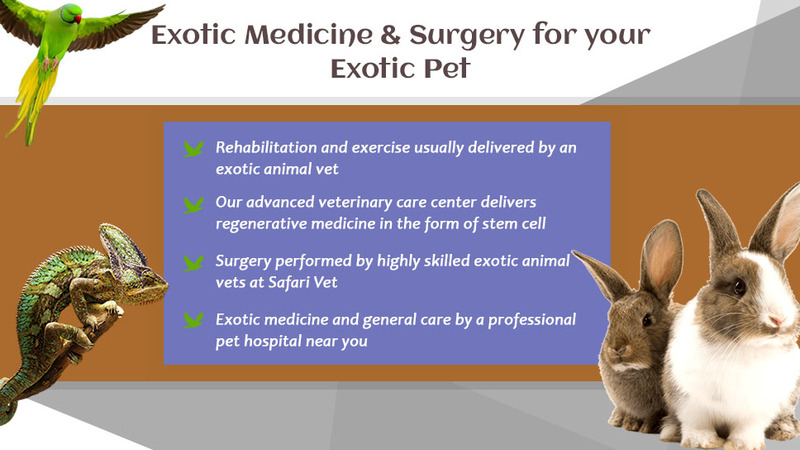 Exotic pet owners can come to Safari Vet’s advanced veterinary care center with the confidence that we can handle all treatment procedures no matter how complex, needed to treat your pet or improve its health. Pets that have undergone complicated treatment procedures usually come out weaker and need time to regain both strength and energy just like humans. Safari Vet offers rehabilitative therapy to help these pets recover their body functions fully. Exercise and specialized feeding are also included in this service. Special exercises like movement on support, using special treadmills, water exercises etc are known to effective in helping recovering exotic pets regain their fitness. One of the best treatment procedures known to man and animals alike is stem cell therapy which is a form of regenerative medicine. The process is quite delicate and complex as only high-level exotic animal vets who are qualified to offer the procedure should attempt it. In simple terms, healthy stem cells are harvested from a healthy part of the animal’s body using special equipment then processed and reintroduced into the affected part of the body. Stem cells initiate healing action by multiplying or regenerating new cells that helps the affected part renew it naturally. It is known to be super-effective in tackling many disease conditions in animals. Exotic pet owners can count on the efficacy of this treatment procedure when they visit Safari Vet’s advanced veterinary care center with their pets. Exotic pets can also benefit from Safari Vet’s advanced surgical treatments for complex cases that cannot be treated or attempted at other pet care centers. We have successfully done surgery on monkeys, apes, zebras and other wonderful animals, relieving them of pain and giving them a chance to have a healthier life. Due to the distinct and uncommon behavior of most exotic pets, handling them can be somewhat different from how normal pets like cats and dogs are handled. These animals are referred to as exotic pets for a reason – they are normally found in the wild. To keep them healthy when sick, extra care is taken in delivering veterinary treatment. Urine, blood, and tissues samples are required for laboratory tests to be certain of the cause of health complications when they come up. Though similar to an extent, the process is a bit different from that of normal, domestic pets like cats and dogs whose symptoms could be diagnosed even without running tests. Safari Vet pet care center offers an exotic pet veterinary procedure to keep exotic pets healthy and their owners happy. Do you have an exotic pet? Get in touch with Safari Vet when next it needs a vet checkup from an exotic animal vet!